iPod usb cable - iPod usb wire - ipod wire. 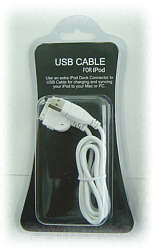 iPod usb cable - ipod usb wire - ipod wire - ipod cable. Update your iPod at high speed with the latest music and data. The iPod Dock Connector to USB Cable offers 400mbs throughput for quick transfer of your music and data to iPod. Compatible with iPods with dock connector only including iPod Nano, 3th Generation, iPod 4th Generation, iPod Photo and iPod Mini.